In this city just a trolley ride from Mexico, you can watch women slap tortillas into shape before you savor spicy south-of-the-border cuisine. Then, to the sound of mariachis, you can wander among stands selling serapes, hand-embroidered blouses and hand-woven rugs. Later you can stroll through the adobe and wood buildings of Old Town State Historic Park, where the city began. And that is just a prelude to the natural wonders—the surf, the glistening beaches, the seals and the zoo—that make San Diego a perfect family destination. At the heart of it all, standing proudly in the center of Old Town’s Heritage Park, is the city’s first synagogue, a reminder that Jews were among the earliest pioneers in this one-time frontier settlement. Though the Jewish community of the San Diego-Tijuana region has its own Mexican flavor in the form of more than 600 families of Mexican and Latino descent, the first Jew in San Diego was German-born Louis Rose. In 1850, Rose arrived from Texas with Judge James Robinson. By 1853, as elected members of a three-man board, Rose and Robinson were running both the city and the county. Rose established San Diego’s first tannery, brickyard and hotel; he was also the inaugural postmaster, a member of the first grand jury and a charter member of the local Masonic lodge. Jews soon constituted some 10 percent of the population. Many were merchants who had shops in Old Town. Rose bought tracts of land on the bay and to the north, but in his attempt to make one of those tracts, Roseville, the commercial hub of San Diego, he lost out to entrepreneur Alonzo Horton, whose downtown development is today’s entertainment district, Gaslamp Quarter. Rose donated land in Roseville, now part of Point Loma, to the Jewish community for its first cemetery. The first official congregation formed in 1861. Orthodox Adat Yeshurun met in homes or rented premises. It changed its name to Beth Israel in 1887 and built its synagogue in 1889 near Balboa Park, at Second and Beech Streets. By then, the congregation was Reform. An Orthodox minyan of East European Jews shared the facility until they built their own synagogue, Tifereth Israel, in 1905, and established a Talmud Torah. In 1939, Tifereth Israel became Conservative, and Beth Jacob took over as San Diego’s Orthodox congregation. San Diego’s Jewish population increased greatly in the late 1930s and early 1940s. The growth was accompanied by the establishment of Jewish organizations, such as the United Jewish Fund, the Jewish Family Service, several branches of B’nai B’rith, a Jewish community center and the San Diego Hebrew Home for the Aged. A Chabad House and Hillel—at San Diego State University—opened in the 1970s. According to a 2003 demographic study, San Diego has 46,000 Jewish households—about 10 percent of the city’s total—consisting of 89,000 Jews and 29,000 non-Jews. Though most adults say that Israel and being Jewish are very important to them, and though nearly all parents want their children to know about Judaism, only 30 percent belong to a synagogue and fewer than half participate in organized Jewish activities. Most of the Jewish adults have come from elsewhere; many are professionals. But there are more than 30 congregations, ranging from Jewish Renewal to Orthodox, Humanistic and kabbalistic. Chabad Center of University City (3813 Governor Drive; 858-455-1670; www.chabaduc.org), located in a former bank, is one of a dozen Chabad outposts in the San Diego area. Its rabbi, Moishe Leider, is also a mohel and serves as a chaplain to the federal prison and hospitals in the vicinity. Hadassah Southern California supports an Area Resource Center in San Diego at 5755 Oberlin Drive, Suite 202 (858-552-9200;www.hadassahsc.org). Additionally, the greater metropolis is served by several chapters. Because the upscale northwestern area of La Jolla used to ban Jewish homeowners (earning it the nickname “La Goy-a”), Jews first lived in central San Diego, then in east San Diego and Chula Vista. However, in the 1960s, when La Jolla wanted a University of California campus nearby, the regents agreed on condition that the area be opened to Jews. Today, La Jolla is the most densely Jewish area in the city, and more than 60 percent of Jews live there or farther north. For local Jewish news, consult the weekly San Diego Jewish Journal (www.sdjewishjournal.com). The two-hour Old Town Trolley Tour provides an overview of San Diego (619-298-8687; www.trolleytours.com). One of the trolleys is named for Louis Rose. Also named for him is Louis Rose Point, a bayside circle of land at the foot of Womble Street, just south of downtown, at what is now called Liberty Station. Chilies hanging from carts at the entrance to Old Town give the site a strong Mexican flavor, but it is also full of Jewish history. Walk into Old Town San Diego State Historic Park at the corner of San Diego and Twiggs Streets. At the southeast corner of the plaza is Casa de Estudillo, a house with a small bell tower. The prominent Estudillo family that lived there also owned Rancho El Cajon east of the city; it was at the ranch that, in 1850, the family welcomed Louis Rose and showed him the way to Old Town. Near Casa de Estudillo is a reproduction of the wooden Colorado House, initially a hotel. A mural of Old Town on the back wall shows a three-story building that no longer exists, owned by Lewis Franklin, who hosted High Holiday services there. At the northern end of the plaza stands a reproduction of the two-story Robinson-Rose House, with verandas facing the plaza. The original was built by Robinson. After his death, Rose bought the residence and lived there with his second wife, Matilda Newman. Today, it is the park’s visitors center, which offers tours (619-220-5422). A mezuza hangs inside the northern front door and a menora is lit during Hanukka. On the northern side of the central plaza, a walkway between the Paseo del Pasado and the two-story Casa de Bandini (now the Cosmopolitan Hotel) was lined with the shops of Jewish merchants and was known as Avenida des Judios (Avenue of the Jews). Exit the Paseo del Pasado to the north and cross Juan Street to see Casa de Carillo, a red-tiled adobe house with a pear tree garden that Rose bought for Newman. The pear garden somehow came to be known as the Rose Garden. Walk two blocks east on Juan Street to the intersection with Harney, where Heritage Park begins. The Victorian houses around the park were moved there by the San Diego Save Our Heritage Organization, as was the first Temple Beth Israel, which stands in the center. The Temple’s painted redwood structure is easily identified by the Tablets of the Law above the entrance and the Stars of David on the porthole-like windows. 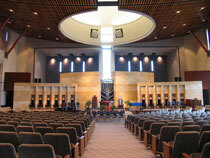 The austere interior has the original Ner Tamid (eternal light). Seating was mixed; the balcony was an organ loft. Today, it is open to the public and can be rented for private events. When the original congregation outgrew this building, it moved to a facility at Third and Laurel Streets that is now used by Ohr Shalom, a mixed Spanish- and English-speaking Conservative congregation. Beth Israel’s current home (9001 Town Centre Drive; 858-535-1111;www.cbisd.org), in University City just east of La Jolla, is a magnificent edifice with a stone-like façade that recalls Jerusalem, expressing the congregation’s strong commitment to Israel. In addition to the 600-seat main sanctuary, in which the bima is made of Jerusalem stone, there is a chapel with Art Nouveau stained-glass windows—replicas of the windows at the Third and Laurel Streets synagogue. An exhibit in the lobby showcases archival photos, letters and other documents. Artist Laurie Gross’s “Kriah” (the rending of clothing in mourning)—a Holocaust memorial of Cor-Ten steel on a base of Jerusalem stone—stands beside the chapel. A gently convex span tops the ultramodern concrete-and-redwood Adat Yeshurun Synagogue in La Jolla (8625 La Jolla Scenic Drive North; 858-535-1196; www.adatyeshurun.org). No Jewish symbols adorn the exterior, but candlesticks and a shofar are carved into the central wooden bima. Modern Orthodox Adat Yeshurun recently won municipal approval for an eruv, the second in the city. Beth Am (5050 Del Mar Heights Road; 858-481-8454;www.betham.com), San Diego’s largest Conservative synagogue, was built in 1999 in Del Mar, north of La Jolla. The building’s arches echo those on the front wall of a ritual hall at the entrance to the Jewish cemetery in Roudnice in the Czech Republic. The egalitarian congregation of 700 families also has a Torah rescued from Roudnice. Dor Hadash (4858 Ronson Court; 858-268-3674;www.dorhadash.org), just east of La Jolla, is San Diego’s only Reconstructionist congregation. Founded 21 years ago, it is housed in a converted light-industry building. Members designed the sanctuary and fashioned its elements, including the wooden Ark with a Tree of Life motif that houses a rescued Torah scroll from Czechoslovakia. The Lawrence Family Jewish Community Center/Jacobs Family Campus in La Jolla (4126 Executive Drive; 858-457-3030; www.lfjcc.org) has a full range of sports and fitness facilities and educational and cultural programs. Some 1,000 children attend the preschool. The Jewish Book Fair, at which high-profile authors speak, and the Jewish Film Festival are among the largest in the country. A Holocaust memorial on the grounds features a granite wall inscribed with names of members of local families who perished. A scientific star in the La Jolla firmament is the Salk Institute for Biological Studies (10010 North Torrey Pines Road; 858-453-4100;www.salk.edu). In 1955, Jonas Salk produced a vaccine that stopped the spread of polio. Nine years later, he realized his dream of an institute in which scientists could explore the basic principles of life. Funded partly by the March of Dimes, designed by Louis Kahn and built on 27 acres overlooking the Pacific Ocean, the Salk institute has become famous worldwide for its research and its design, an icon of modern architecture. Balboa Park (www.balboapark.org), just northeast of downtown and billed as the nation’s largest urban cultural park, boasts 15 museums, performing-arts venues, gardens and the San Diego Zoo. Many arts organizations are housed in flamboyant Spanish-Renaissance style buildings put up for the 1915-1916 Panama-California Exposition. In 1999, the San Diego Zoo received a bearded vulture (peres in Hebrew) from the Tel Aviv Zoo. Named Shimon Peres after the elder statesman—today Israel’s president—that bird is no longer alive, but the zoo (www.sandiegozoo.org) continues to be the only American zoological institution involved in an international breeding program of bearded vultures, an endangered species. Ostriches, hawks and pigs, species mentioned in the Bible, can be seen on “safari” at the Wild Animal Park (15500 San Pasqual Valley Road in Escondido; 760-747-8702; www.wildanimalpark.org), which also has rhinos, giraffes, lions and tigers. Since Prohibition days, Tijuana, just 20 miles south of downtown San Diego and easily reached by trolley or car, has been California’s Mexican playground. And though many of Tijuana’s Jews have moved to San Diego, two synagogues remain. The mainstream Jewish community began in the 1920s with a few merchants. The early 1940s saw an influx of refugees from Nazi Europe, and the community eventually had both Ashkenazic Jews and Sefardic Jews, who prayed separately. Some Jews helped establish major department stores; others were owners of curio shops on Revolution Avenue, as was the father of Isaac Artenstein, whose movie Tijuana Jews documents the lives of Jews in his hometown. More recently, young families fleeing the pollution and violence of Mexico City have relocated here. Built in the 1960s, Centro Social Israelita is a combined social and sports center, Orthodox school and synagogue led by a Chabad rabbi (3000 Avenida Cuahutemac Sur; 011-52-664-686-2692) and with its own ritual slaughterer. Visitors can have a kosher meal at the center and hear members discuss how their families came to Tijuana. Though there are no external Jewish symbols, the modern sanctuary does feature 12 stained-glass windows depicting scenes from Jewish history; Friday evening services are followed by a communal meal. Congregacíon Hebrea de Baja California (207 Amado Nervo; 52-664-681-1667) has about 100 members, all converts from Catholicism, and is led by Carlos Samuel Salas, who believes he is descended from Marranos. Situated behind a high gray wall, the synagogue houses four Torah scrolls inside a hand-carved cedar Ark. Victoria Jacobs’s Diary of a San Diego Girl, 1856 (N.B. Stern) provides a firsthand account and details of the city’s early days. Louis Rose: San Diego’s First Jewish Settler and Entrepreneur (Sunbelt Publications) portrays the early days of the frontier town while describing Rose’s life. Author Donald H. Harrison is a tireless chronicler of Jewish life in San Diego and copublisher and former editor of San Diego Jewish Press-Heritage. Some Like It Hot, the 1959 comedy starring Marilyn Monroe, Tony Curtis and Jack Lemmon, was filmed at the Hotel Del Coronado. Famous for its red Victorian turrets, the luxury hotel was built in 1888 to attract tourists to Coronado, just across the bay from San Diego, and was owned from 1968 to 1996 by M. Larry Lawrence, a prominent Jewish politician and philanthropist. Igor Olshansky, 25, the only Soviet-born player in the National Football League, is a member of the San Diego Chargers’ defensive line. Irwin Jacobs revolutionized the cell phone industry through his company, Qualcomm, by adapting technology used by the military in World War II. Jacobs and his wife, Joan, have donated much of their wealth to arts and culture organizations, the JCC and the Qualcomm Stadium, home of the Chargers. San Diego International Airport is just a few minutes’ drive from Old Town, where the complex of tile-roofed buildings known as The Hacienda Hotel Old Town (4041 Harney Street; www.hacienda hotel-oldtown.com) offers a panoramic view of the city and bay. Kosher food is available in abundance. Orly’s Bakery in La Jolla sells halla, pastries and quick lunches (6140 Regents Road; 858-622-9607). Ralph’s Supermarket at 8657 Villa La Jolla Drive (www.ralphs.com) has an extensive kosher food section that includes fish and meat. In the University Heights area, The Place is a glatt kosher deli and market (6499 El Cajon Boulevard; 619-286-6499) while The Dairy Place (across the street at 6450 El Cajon Boulevard; 619-286-6450) offers sushi as well as Italian and Mexican dishes.